I had a very profound experience that fits in perfectly with our March newsletter and wanted to share it with you. As many of you know, I make my own herbal infused shampoo which I also sell. I had recently made a new bottle for myself but hadn’t taken the time to add the essential oils. When I went to reach for my usually bottle of Rosemary, I discovered that I had run out. So I grabbed a bottle of Rosemary essential oil which was a different chemotype (having different chemical components) and took a whiff. It was heaven! I couldn't stop smelling it! I even confessed to Kevin that I had found another love and held up the bottle of Rosemary ct verbenone. I added 25 drops to my shampoo, jumped in the shower and started washing my hair. Here's what happened! My mood going into the shower was one of tired, lack of motivation, some mental confusion with a slight bit of mild depression. As I was washing my hair, ideas for the business started running through my mind. Gone was the tiredness, gone was the mental confusion and lack of motivation. By the time I finished my shower, I was back to my normal self. I already knew the emotional/energetic aspects of Rosemary, but I wanted to look in Andrea Butje’s new book, "The Heart of Aromatherapy", to read exactly what she had to say about Rosemary. She describes it as follows: it helps us perform at our best; it helps combat sluggishness and replaces it with motivation and inspiration; if we are having difficulty focusing on tasks that we want to do, it brings clarity to our mind through introducing peace and calm. Bingo! That was my experience, and it lasted all day! 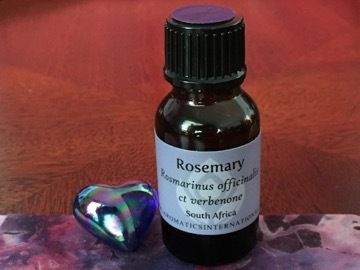 These are my suggestions for using Rosemary (Rosemarinus officinalis ct. verbenone). If you wake up tired and not so excited to face the day, place 3-5 drops of Rosemary on the floor of your shower in front of where you stand. Then when you turn the warm water on, it will diffuse the Rosemary. You will be surrounded by this lovely smell, and you’ll step out feeling much better. If you are studying, place a couple drops of Rosemary on a tissue and inhale it often. This will provide the focus and clarity you're needing. If you have a head cold, fill a bowl with boiling water and place 1-2 drops (not more) of Rosemary in the water. Lean over the bowl covering your head and bowl with a towel. Inhale the steam for 2-3 minutes to clear your sinuses and mind.